It’s easy to get a list of all the software installed or upgraded on a Linux system. If you’re running CentOS, RedHat or Fedora, just run the below command on the terminal to get the complete list of all software installed on your PC or server. If you’re running Debian, Ubuntu or Linux Mint, go with either of the below commands. The following command will work fine too. 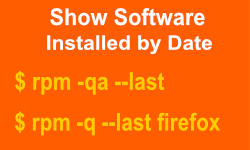 However, there are occasions when we’d like to know about the software on our Linux system by date of installation. It’s easy to find software installed by date on rpm based package management systems like CentOS, RedHat and Fedora but hard on dpkg systems (Debian, Ubuntu, Linux Mint, Lubuntu, and Xubuntu). Let’s first take a deko at how to do it on rpm based Linux systems. Here’s an example of a command to find software installed by date on a CentOS 7 system. It’s harder to get the list of software installed by date on Debian, Ubuntu, Linux Mint and other dpkg based Linux distributions. Although there are some workarounds like examining the dpkg.log file, they’re not foolproof because the log files are rotated after some time. If the log file has been rotated, you should try the below command. But since /var/log/dpkg.log. * files are eventually deleted by log rotation over time, you have no reliable method of getting the full history of software installations by date on your Debian or Ubuntu Linux PC or server.